Sotogrande is one of the most southerly tourist resorts on the southern Costa del Sol. The nearest airport is just across the border in Gibraltar and less than fifteen minutes away by car from the resort, while Malaga International Airport which is the busiest airport servicing tourists is approximately an hour away by car. Sotogrande is a posh upmarket resort with a pretty marina, beaches and golf courses a plenty, five star hotels as well as villas and apartments for weekly rental. To make the best of your visit and holiday we cover everything you need to know about Sotogrande. We also have photos, picture galleries, views, videos and Sotogrande webcam. Are you an expat in Sotogrande? What do you like/dislike about it? Let us know in the comments box at the bottom of the page. Of lesser note but still important for health-minded tourists are good facilities for swimming, tennis and gyms. The annual polo event (El Torneo Internacional) held in August at The Santa Maria Polo Club, is also important for tourism as it attracts many rich and famous people from all over the world which of course boosts Sotogrande’s reputation. Needless to say the weather and climate in Sotogrande are perfect for tourism with very hot summers and mild winters. 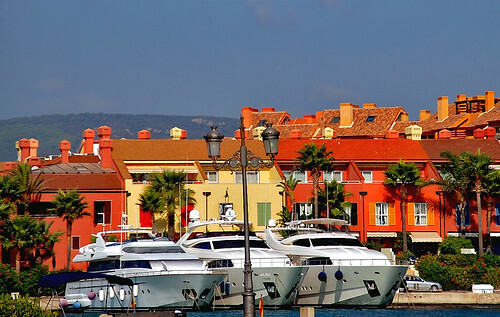 For entertainment and nightlife there are many fine restaurants in Sotogrande as well as bars and cafes, especially in the Port area which of course has the marina with it’s many luxury yachts berthing there. There are two well-known beach clubs with good tourist facilities – El Octogono Beach Club and El Cucurucho. These typically have restaurants, play areas for children, bars and the typical water sports are offered such as sailing and wind surfing. Sotogrande is also a popular tourist resort because of it’s carefully planned and sensible growth and development which has helped it grow into a prestigious and wealthy resort. Sotogrande is a not so much a town as a development which began in the 1960’s but it is worth reiterating it is not a sprawling urbanisation but a classy and beautiful place. Sotogrande was originally an area of great beauty and it’s potential was seen by an American property developer who bought the land and began to transform it into the luxury development it is today with it’s landscaped grounds surrounding the lake and the wide palm-lined avenues. Sotogrande is located on the far left-hand side of the Costa del Sol just before Gibraltar after which the Costa del Luz begins. Sotogrande is situated in the province of Cadiz. You can see it’s location on our map of Sotogrande. It takes about an hour and a half from the main Costa del Sol airport of Malaga. Although there are few flight options Gibraltar airport is just 25 minutes by car which may in the future become a better alternative. Going up the coast from Sotogrande there is Torreguadiaro, Punta de la Chullera, San Diego, Martagina and then La Duquesa. Heading down the coast towards La Linea de la Concepcion is Guadiaro, Pueblo Nuevo de Guadiaro, Cortijo de Borondo, Punta Mala, La Alcaidesa and Santa Margarita. If you are thinking of moving to Sotogrande, then you must read our interview with Tracy Thomson of Ayling International Property Services below. They have been established since the 1970’s and the “go to” experts in Sotogrande. Tracy, what would you say would be the advantages to living in Sotogrande compared to other Costa del Sol towns? Sotogrande offers what few if any other coastal resort can match: Polo, water sports, equestrian activities, tournament standard golf courses, beach clubs extraordinaire, restaurants that rival Puerto Banús, Dubai or any other premiere destination. Sotogrande in July and August has a special buzz. It is the time when many Madrileños, Sevillanos and international travelers come to visit their second, third or fourth homes. The rest of the year has a different, more sedate, air about it. A time when the locals bask in the less high energy atmosphere as they quietly get on with their everyday lives. We talk here of the property owners and renters alike. It is a time when dog owners once more get to walk with their dogs along their familiar haunts. It is an idyllic area. Blue flagged beaches and the National Park are but a taste of the splendors on offer. All different, all invoking different responses depending on the season, but always with that sensation of quality and luxury that makes a person feel there is nowhere else they would rather be. A high proportion of the local population is made up of Spanish nationals. They work in banks, restaurants, hardware stores, etc and lend much vibrancy and character to the world of expats and holiday makers. The Virgen del Carmen is celebrated this Saturday. It is a wonderful time when the protector of sailors and fishermen is escorted out of the port surrounded by a cavalcade of boats manned by skilled captains. Pilgrims travel on foot to the port tower where the statue of Virgen del Carmen is placed with “mucho gusto” onto her special boat. The night sky is lit with camera flashes and happy chatter fills the air. That is just one example, the polo is another…and so the list goes on. In the port, you would be mad not to try them all out. Sebastian’s restaurant La Quinta in the Port is as stylish and impressive as they come with its own coffee roaster, chilled and ambient temperature “bodegas” and prime Argentinian beef tapas. Then there is Jan Stael’s delicatessen – a touch of Belgium class. The Molino del Conde has just relocated from across the main road in Pueblo Nuevo and is another not to be missed experience. Naturally, it is impossible not to mention the Ké bar with its self declared meeting place function. The service is fast and friendly, the tapas divine and their Caesar Salad adds an extra touch which is singularly unique: strawberries. Should you fancy watching a football match where else would you go but to the Hairy Lemon? And Friday nights it does an amazing array of tapas at only a euro a dish, accompanied with tasteful, live music. Another restaurant with its own micro brewery, like the Hairy Lemon, is Mara’s fish restaurant. It is the place to go to for that special celebration. Finally, try a cocktail at Midas around sunset. Spectacular views. 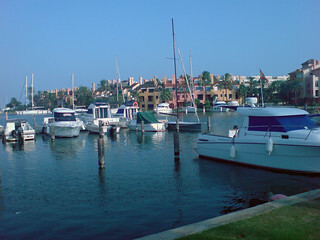 The few selected here are just a small part of Sotogrande, in the port and along the marina. There are many more to enjoy. San Henrique, San Martin, Jimena de la Frontera, Gaucin are all wonderful. Sotogrande International School is the best around. Many of the communities are gated with their own private security and in addition there are barrier controls at all the arterial roads into and out of Sotogrande. There are also undercover police who operate in the area, although they are largely concerned with preventing narco trafficking. Nowhere is 100 percent crime free, but Sotogrande is one of the safest which is why so many wealthy expats choose this area for their children. The Sotogrande property market is slowly rebounding, both for sales and rentals. With many people choosing to commute to work in Gibraltar, they tend to rent first and then buy. But that is just one sector of the community. There is a feeling in the air that growth is all around. Some banks still have repossessions on their books and every once in a while they come onto the market. There are also people who need to free up capital and are prepared to drop prices to guarantee a quick sale, but in general Sotogrande has and always will be a desirable area in which to live and buy. This is reflected in its prices. Take a look at our website. Sotogrande is an urbanisation in itself. A 5,000 acre estate that includes three championship golf courses, a beautiful marina, polo grounds, tennis, beach clubs, sailing clubs and spacious clean beaches. Shopping facilities, banks and all back up services are at hand, including all types of restaurants, bars and discos. Attractive villas of various sizes set in tree lined avenues, high class apartments and plots with splendid views offer every opportunity for the discerning buyer . How much are the typical property prices in Sotogrande for apartments, villas etc? You can get a bargain villa for as little as 400,000 euros right up to the other end of the market where a villa would set you back millions of euros. A 2-bed apartment can cost as little as 275,000 euros or again attain far higher prices depending on which part of the exclusive estate they are in and what their specifications are. Any tips and advice to people looking to buy in Sotogrande or surrounding area? Consider taking on a short let to get to know the area and put yourself in the hands of registered estate agents that go the extra mile. Like us for example, if we do not have the exact property that our client is looking for on our own books, we contact other agencies until we find that wow factor property. It takes the stress out of your property search whilst allowing you the freedom of knowledgeable insight and support into the Sotogrande property market. Don’t buy a lemon, buy a property with a lemon tree! Tracy, thank you so much for taking the time to help our readers with your experiences in Spain. Our goal is to connect the Seller with the Buyer and to support each party on the journey. There is something very special about buying and selling properties. Normally, it is the Seller who pays our commission, but without the Buyer there is no sale – so it is our aim to create an environment with mutual respect and transparency. We empathise and strive to use our connections and know how to make your Real Estate experience a trustworthy and rewarding one. Tourists to Sotogrande who enjoy a round of golf simply must visit the golf course of Valderrama, scene of the famous European win against the US team in the Ryder Cup of 1997. This is one of Europe’s top golf courses and it still regularly hosts the Volvo Masters one of the European Tour’s top events. Other golf courses and country clubs in the Sotogrande area include: the Real Club de Golf Sotogrande, Club de Golf La Canada, La Reserva de Sotogrande, Almenara hotel-golf, the San Roque Club and Alcaidesa links golf course. Sotogrande is close to where the Mediterranean meets the Atlantic Ocean so the sea can be cooler than further up the Costa del Sol. Sotogrande’s beaches are not particularly noteworthy. Sotogrande is very close to Gibraltar and many people live here and commute over the border to work in Gibraltar. Many of these people put their children into the very good Sotogrande International School, known to be one of the best on the Costa del Sol. So Sotogrande can offer good employment opportunities (in Gibraltar) while you enjoy the cheaper Spanish cost of living and more relaxed way of life. 1. Trip to the glamourous tourist resort of Marbella known for its rich and famous residents and visitors. The place for designer shop and luxury yachts at the marina. 2. Mijas is a lovely white-washed village in the mountains. 3. Malaga is the main city on the Costa del Sol but it does have the Picasso museum. 4. Granada to visit the Moorish Alhambra Palace or to ski! 5. Take a trip over the Mediterranean across to Morocco! 8. Go inland to the pretty town of Ronda. 9. Visit the Rock of Gibraltar. 10. Go further down the coast (not far) to Tarifa where the Mediterranean meets the Atlantic, famous for its strong, consistent winds which attracts windsurfers from all over the world. Whether you’re looking for a place to rent or to stay at permanently, you can take advantage of the services from the real estate agents in Sotogrande who are more than willing to help you in finding your ideal residence. You can contact Ayling International Property Services (aylingsotogrande.com, Tel. +34 956 790 317); Sotoestates SA (www.sotoestates.com, Tel. +34 956 615 351) and Holmes Sotogrande (www.holmesotogrande.com, Tel. +34 956 795 340). Page Summary – This page contains unique content about the resort of Sotogrande, a popular tourist destination on the Costa del Sol coast of Spain. Welcome to Polo Valley in Sotogrande, where we focus on spreading our passion for the game of polo. From beginners to professional, the Polo Valley team aim to tailor your polo experiences and make polo more accessible through our polo holidays, polo courses and unique experiences. Ready to discover your new passion? There is a reason they call polo ‘The game of Kings’. The sport combines skill, speed, timing and horsemanship. At Polo Valley you will be taught everything you need to know, from putting your boots on and mounting one of our ponies, to understanding the rules and playing your first ever polo match. With a specific program designed for beginners with little or no riding experience. Within no time at all you will be riding, hitting the ball and playing your first instructional match.